In an attempt to get my work more “out there”, I have entered the General Digital category of The Royal Photographic Society International Projected Image Exhibition 2010. 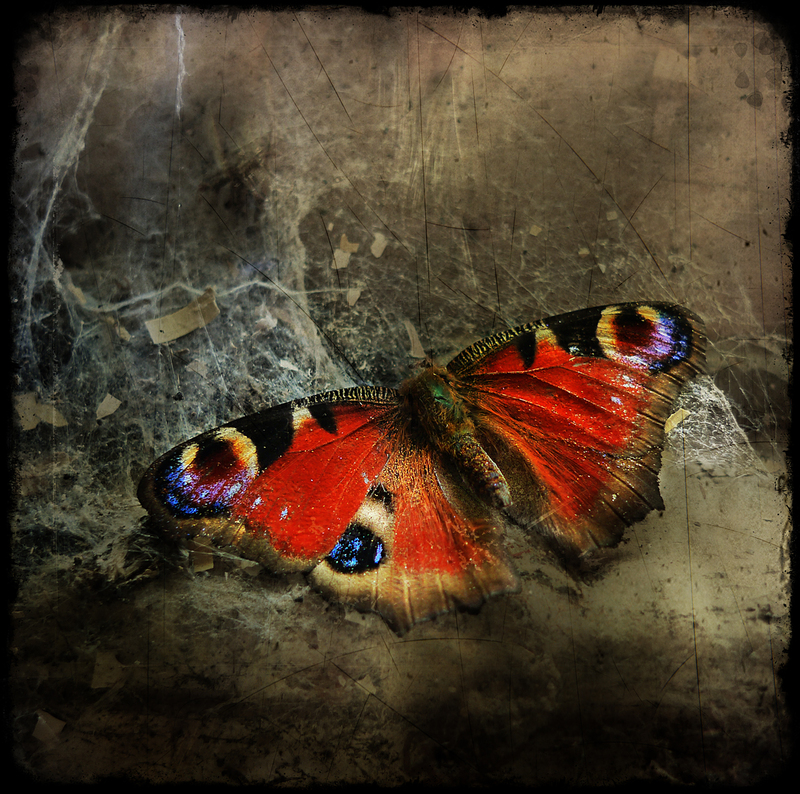 The theme running through these images is my developing (and some may say, disturbing) obsession with dead insects, moths and butterflies. I have come across so many of these hapless creatures, trapped in webs thick with dust and decay, during visits to various UrbEx locations over the past few months, that my love of detail, of “seeing the smaller picture” combined with a dark fascination for dead things has created this idea in my head. The title of the first image “Beauty Ensnared” could really apply to any of these images, for even though I do not like Daddy Long Legs (and will run away squealing if one approaches me), I do appreciate the smaller creatures on this earth and have had an interest in Entomology since childhood. Being overly sensitive and prone to Anthropomorphism, I hate to see these winged creatures trapped indoors, helplessly and fruitlessly banging their tiny heads against unforgiving glass and concrete in a desperate bid to escape, before becoming exhausted and bumbling into the sticky spider webs which are to become their final resting place. 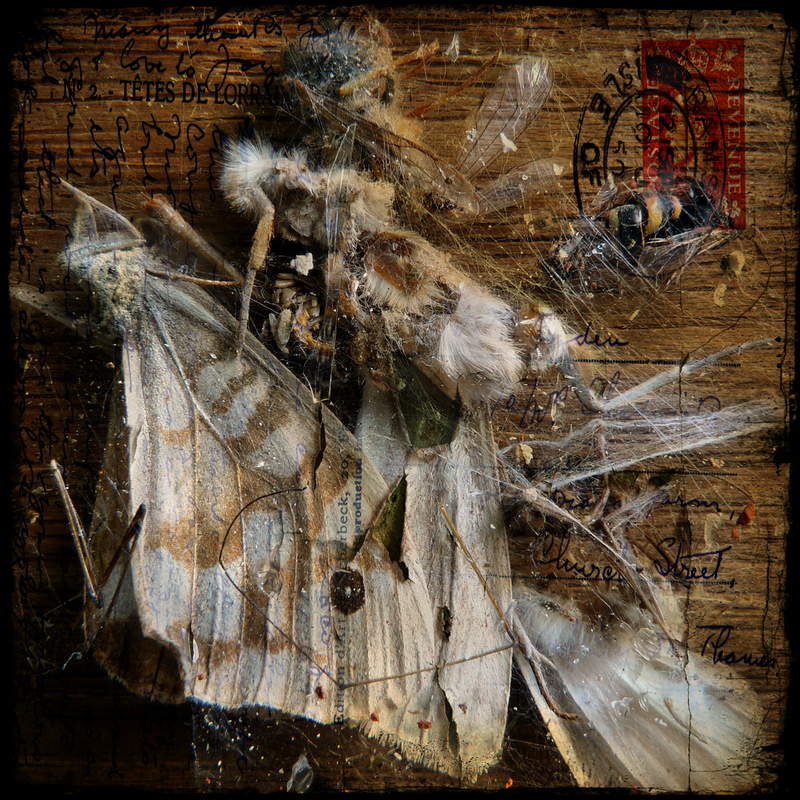 In these works I have attempted to capture a sense of the nightmare that I myself would feel if trapped somewhere and unable to get out, by making full use of the net-like qualities of spider webs encasing the delicate insects, and textures to enhance the setting and create a painterly feel. 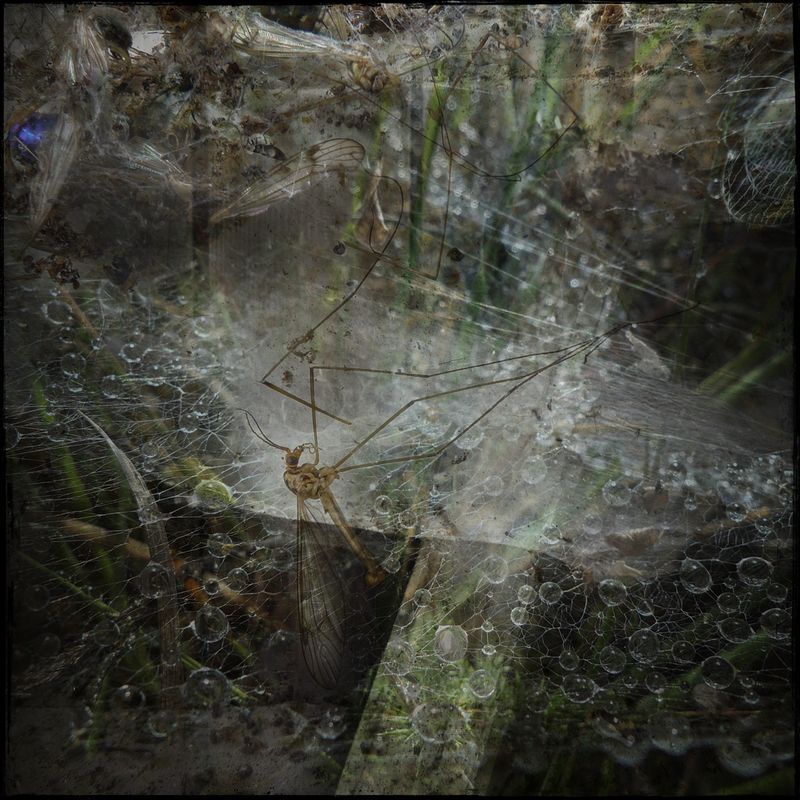 All the images feature multiple layers – “Caught in a Web of Deceit” uses four separate photographs I have taken, merged and blended to make one, and during this process I see patterns developing between the layers that I draw out as far as I can to create additional unsettling elements which bring to my mind creatures typically seen in the work of Heironymus Bosch (whom, perhaps unsurprisingly, I love). I often see faces in many things and inanimate objects – clouds, tree bark, stones, water – and I have detected many expressions and watchers in the tiny elements of these works. I hope to make the viewer really look into the depths of each photograph, suspend disbelief and harness the imagination, to see beyond the straightforward elements into something altogether darker. I just hope that this is not all too macabre for the selectors of the exhibition! N.B. for those readers familiar with my work, you may recognise ‘Beauty Ensnared‘ and notice that it is different from the original – this is because the previous version incorporated a texture from someone else, and the rules of the competition stipulate that the entire work must be that of the photographer – so I reworked the image using my own textures and border. The original was very popular on Flickr, so I hope the new version is up to scratch! For update on what was accepted for the exhibition, please see here. This entry was posted on Tuesday, August 3rd, 2010 at 23:25. 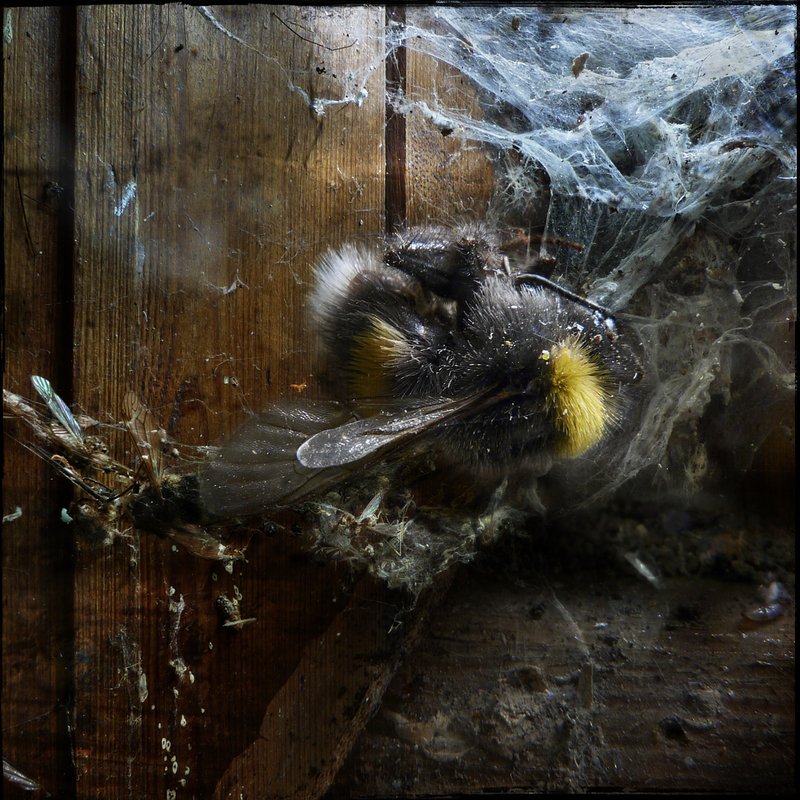 It is filed under Exhibitions, Photography, Royal Photographic Society and tagged with dead, Digital Image Manipulation, exhibition, insects, Photoshop, Royal Photographic Society, RPS, texture, Urban Exploration, UrbEx. You can follow any responses to this entry through the RSS 2.0 feed.